Here's the best resource for finding the complete works of Edgar Allan Poe online. Besides his stories, poems and writing, the site includes manuscripts, letters, and documents. A very valuable archive, and well maintained. Look here first. Poe Stories doesn't quite have a complete collection of short stories by Poe, but they do a really good job of presenting the ones they have. They've selected the most important poems by him, too. Some of the "bigger" more difficult words are hyperlinked here to definitions, which could be helpful for a lot of people. The site also offers a discussion forum (though it's not been posted in for 3 years) and a really useful photo gallery. The Poe timeline is very helpful for research, too. This site offers his short stories, as well as a play (Politian), and non-fiction work (The Narrative of Arthur Gordon Pym). I run into pop-up ads here often, so it's not my favorite site to use for etexts. 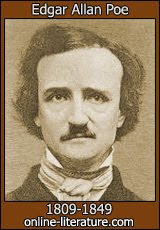 The About.com Classic Literature site offers a good amount of Poe's short stories and writings, in alphabetical order. As you'd expect from sites at About.com, everything is well organized, clean and neat and easy to navigate. And of course, you can rely on Project Gutenberg to provide you with Edgar Allan Poe's works. They offer it in HTML, plain text, and Kindle versions.